January is traditionally a slow month for new album releases but 2014 looks set to buck that trend with a number of highly anticipated releases scheduled to drop right in the middle of the post Christmas slump. Scottish Post Rock pioneers Mogwai are first up with the follow up to their well received soundtrack for French supernatural chiller Les Revenants. Mogwai are considered by many to be the godfathers of the Post Rock scene – their debut album in 1995 proved to be the blueprint for that genre -lengthy instrumental pieces that quietly built towards punishing crescendos of distorted guitar noise. They spawned a host of imitators as facsimile bands saw an opportunity to tap into the niche but almost religiously zealous fan-base that had latched on to the Post Rock movement. Rave Tapes is their eight studio album (not including soundtrack work) and sees them further distance themselves from the ‘quiet loud’ dynamic that was such a hallmark of their early releases. It is probably closest in spirit to their 2003 album Happy Songs for Happy People with an emphasis on a more textured approach, with electronic elements very much to the fore. That is not to say that guitars have been discarded completely – they still feature heavily throughout, but this is a more restrained effort where the temptation to go for the big finish is never yielded to. Opener ‘Heard About You Last Night’ showcases this more restrained approach; the sky kissing guitars in the chorus offer the tantalising hope that Mogwai are about to reward us with one of their trademark finishes but it never happens. ‘Remurdered’ is built around a fat, distorted electronic bassline that circles in on itself, hypnotic, trance-like. The ghostly remnants of their work on the soundtrack to Les Revenants can be heard buried somewhere on tracks like ‘Deesh’ and ‘No Medicine For Regret’ while ‘Blues Hour’ features the only real vocal performance on the album. Vocals have featured occasionally on Mogwai albums, with varying degrees of success and this is one of their best efforts to date, the understated melody set against one of the most epic sounding tracks on the record working particularly well. 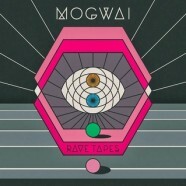 Those fans that still hanker for a return to the Mogwai of Young Team or Come on Die Young will have to suspend that hope for a little while longer – Rave Tapes is a tamer beast that rewards patient listening with a record that is their most consistent release in quite some time.